Quick overview Examines buildings from the past half century or so that pushed the boundaries of what was architecturally acceptable when they were built. This book explores the history of these buildings and their makers, presenting relevant biographical factors and socio-cultural influences that impacted on the distinctive designs. In Why You Can Build It Like That, John Zukowsky examines buildings from the past half century or so that pushed the boundaries of what was architecturally acceptable when they were built. 100 striking international examples of modern architecture are categorized into thematic chapters that reflect form as well as society. Zukowsky explores the history of these buildings and their makers, presenting relevant biographical factors and socio-cultural influences that impacted on the distinctive designs. 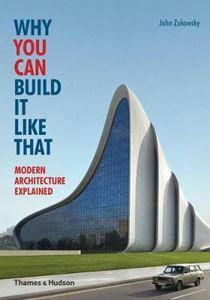 The book includes the works of heroic early modernist architects such as Ludwig Mies van der Rohe and Frank Lloyd Wright, alongside long-established architectural firms such as Skidmore, Owings & Merrill. It also features mavericks of the past and present Bruce Goff, Shin Takamatsu and Shigeru Ban and singular architectural wonders that reflect their own times. Readers will find out why all the featured buildings look the way they do, and why they were created when and where they were. Zukowskys original text unravels the rich and complex stories that exist behind the design of some of the worlds more unconventional monuments, revealing exactly why each building is one of a kind.